These playful, sweet-smelling candles provide jobs for women refugees living in America. As Neptune moves into its third moon, it's time to invest in self-care and a new candle. This new candle, to be exact. These playful zodiac designs are more than sweet-smelling accents in your home: They provide jobs for women refugees living in Massachusetts. Prosperity Candle, a fellow B-Corp, was started to help break the cycle of poverty for people from developing countries. Today, their artisans proudly craft each candle featuring scents inspired by your sign's unique characteristics. Think: sandalwood and oak moss for the outdoor-loving Sagittarius, and chamomile and sage for the warm-hearted Taurus. The artisans melt soy wax with essential oils, pouring each all-natural, dye and enhancer-free blend into shiny, recyclable tins. Finished with a cheerful label that details each sign's signature traits, it makes a thoughtful gift for horoscope enthusiasts and friends who love to support a worthy cause. Handmade in Easthampton, Massachusetts. See scent profiles for each zodiac sign here. Ted Barber started his journey working to help alleviate poverty in developing countries. When he met Amber, another humanitarian worker who helped African artisans earn a living wage, they decided to team up to fight the global cycle of poverty from their hometown in Massachusetts. Focusing on women as artisan-entrepreneurs, they launched their charitable business overseas, then partnered with local organizations to help refugees living in the U.S. as well. Today, Ted and his wife Patsy work side-by-side with women refugees relocated to western Massachusetts through UN programs. A fellow B Corp and force for good, Prosperity provides a meaningful, living wage for the artisans who work there. When you purchase a Zodiac Candle, you can feel good about supporting a wonderful cause. For best results, keep wick trimmed to 1/4 inch, burn no more than 3 hours at a time, keep away from drafts and flammable objects. Burn on a heat resistant surface and away from children and pets. Never leave a burning candle unattended. Bought it as a friend for her birthday. I was with her when she used it (not the very first time though) and I loved the subtle scents. It wasn't overpowering at all, which is what I find with most scented candles. I got the Aquarius candle for my best friend for her birthday. The "Aquarius" description was spot on for her, and she loved the smell! We also really love that the candles provide jobs for female refugees living in the United States. I liked the simple packaging and candle scent. I love candles. It doesn't matter where I get them from, I love them all. 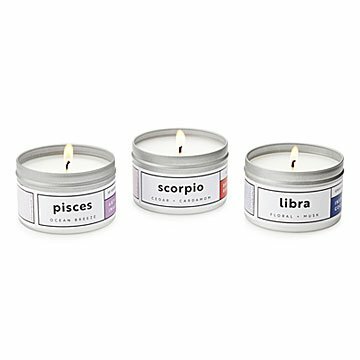 I enjoy skimming emails for items I'd like to get in the future and saw these horoscope candles. I bought my husband one just because and he definitely enjoyed it (even though secretly the candle was more for me). I also love what the company stands for and that they are helping do good things. This candle burned very quickly and did not burn clean. It creates soot as you burn it. I tried trimming the wick after each use and it still was very messy and put soot on my walls and ceiling. I enjoyed the scents of this candle. This candle smells great but it does burn pretty quickly. Nice extra gift for a birthday.